For many companies, franchising their business is an effective way to expand their brand to various locations around the world. Most successful companies such as the fast-food chains, famous brands, and other establishments that we know today have franchised their business to different dealers or franchisees. Franchising programs are offered by many large corporations or businesses with well-known brands. Franchising is a type of marketing method or arrangement between two parties. In a franchise, the franchisor agrees to provide the rights to the brand that will be used by the business processes to the people who are interested to franchise the business, also known as the franchisee. When you plan on franchising a particular brand, there are certain documents and steps that you need to have. How exactly will you determine if you are qualified to be a franchisee? If you plan on franchising a business or a brand, one of the most important documents that you need to have is a franchise application form. 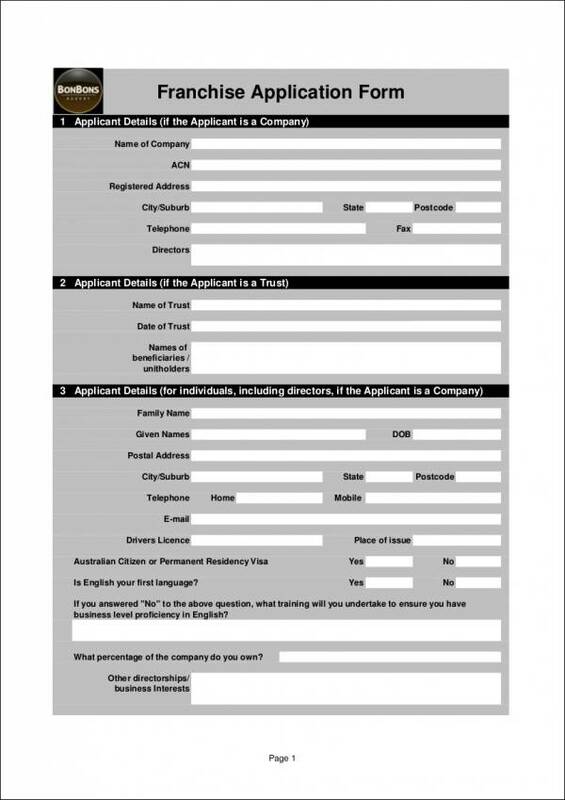 A franchise application form is a document that contains all the essential information needed by a business or a franchisor in order to determine whether you are fit to franchise their business. Through a franchise application form, the business will be able to effectively evaluate your application through the information that you have provided in the document. If you are planning on franchising a brand but don’t exactly know how to create and fill out a franchise application form, then this article is for you! 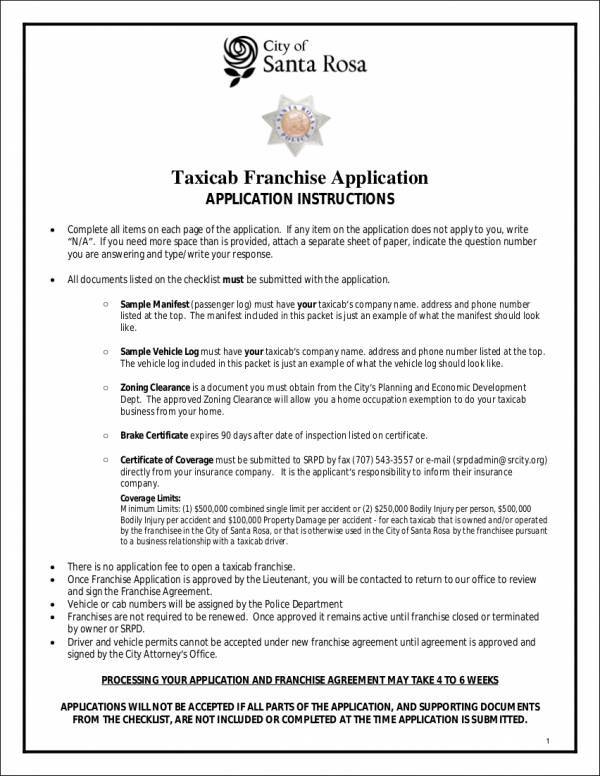 The samples and guides that we have provided below will be useful in helping you create your own franchise application. You can also see franchise agreements. Before you start creating or filling out a franchise application form, it is essential for you to have a clear idea of the items and details that are required or the information that you need to include in one. To help you further understand the components that are needed in a franchise application form, we have listed below the items that you need to include in your document. 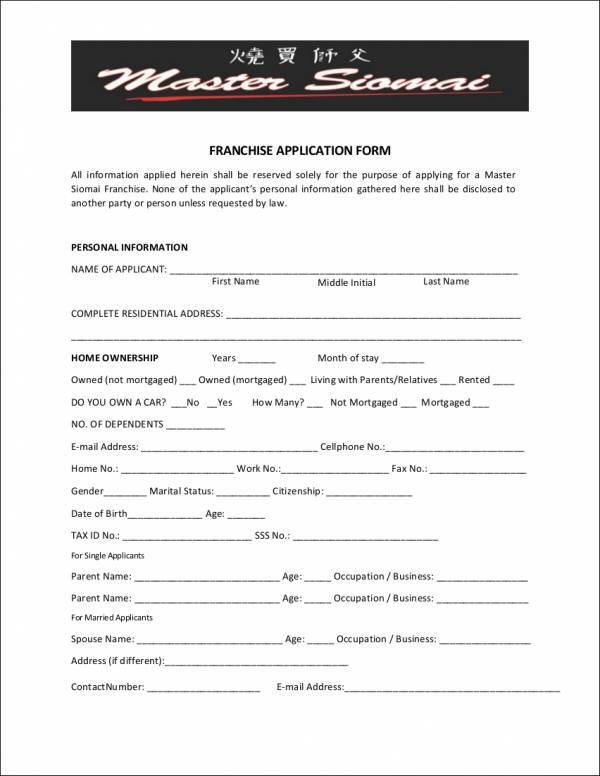 You can also see franchise agreement forms. 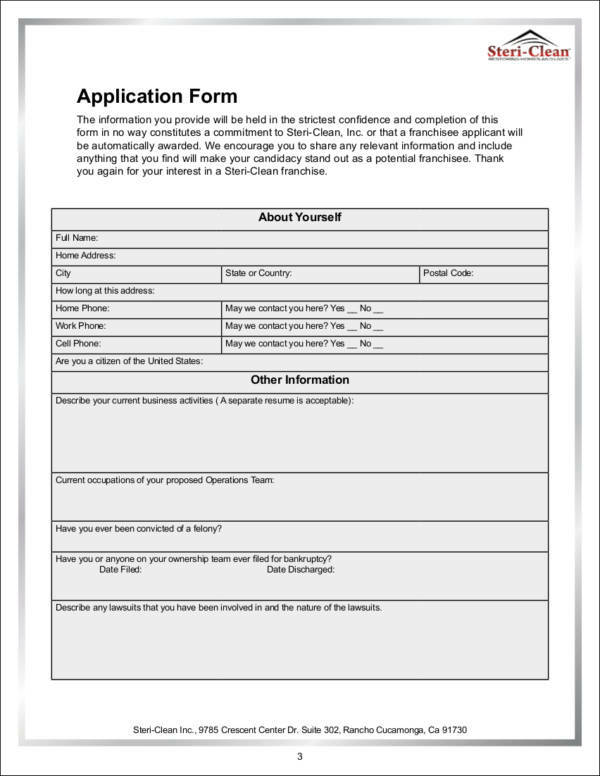 A detailed personal information of the applicant or the franchisee. One of the components that you need to include in a franchise application is your personal information. 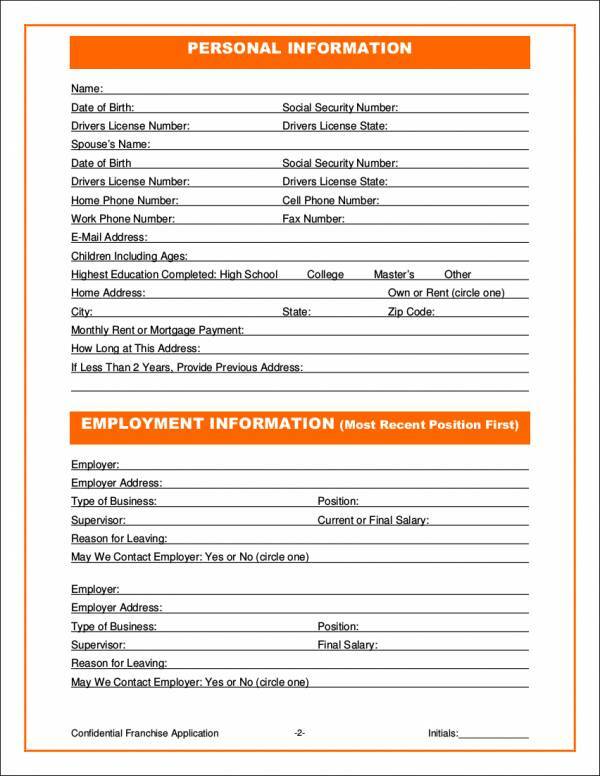 This includes your name, address, contact information, as well as your character background and other biographical information. It is important for you to include all the necessary information to ensure that the franchisor will be able to determine whether you are a qualified candidate. Your business interests. Another item that franchisors look for in a franchise application form is your business interests. Franchisors want to know more about your business background, which is why it is essential that you include this information in your franchise application. Specify in the form if you have previously owned a business and if you have any business partners. Also, indicate if you have been involved in any lawsuits or any legal cases. Specific preferences for a business location. Franchisors or businesses will also want to know if you have a preferred location for the franchise that you would like to have. It is important that you indicate all the locations that you are considering and whether you are open to being relocated. Your employment history. Your employment history is also important when creating a franchise application. It is important that you write in detail your employment histories such as the company or companies where you have previously worked, how long you have been employed in that particular business, your job position, and the compensation that you got for the work that you have done. This information is necessary in order for the company to identify whether you are qualified to represent their business. Your educational background. An individual’s educational background or experience is an important aspect of any franchise applicant. The experiences and the training that an individual has had previously determines whether he/she will be successful in the business. This will allow franchisors to properly evaluate an individual or entity. Your financial statement. Whether you are an individual or a company applying for a franchise, your financial statement is an essential part of a franchise application that most franchisers look at. Your financial information such as your assets, net worth, total income, and liabilities will help businesses or franchisors determine if you can fund or pay for the royalties, fees, and other expenses of franchising a brand. The information that we have specified above is essential if you want to create or develop your own franchise application. Now that you have a clear understanding of the items needed in one, ensure that you have these items included in your document in order for you to have a highly usable and effective franchise application form. 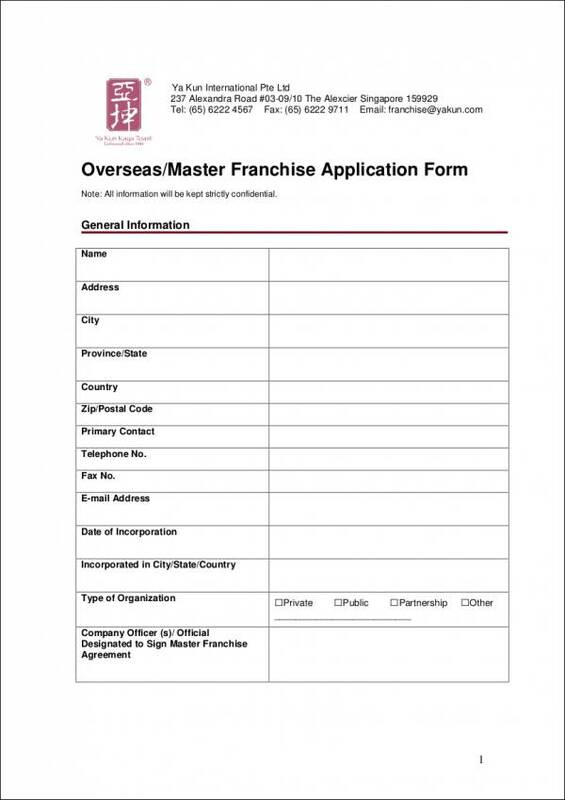 You can also use the franchise application form samples as well as the templates that you will find on this page should you need a more specific outline of the document. There are a number of advantages as well as disadvantages of franchising a business or a well-known brand. In a franchise, both the franchisor and the franchisee can benefit from it. We have listed below some of the advantages and the disadvantages of franchising a business for both the business and the franchisee. You may also see sample franchise agreements. Franchising allows businesses to expand without the need for capital. Businesses who want to expand need to have a capital in order for it to grow. The capital is used to cover expenses when a business decides to put up a new establishment or branch of the business. Through franchising, business owners will no longer need to have capital since the franchise fee that a franchisee will pay the business or the franchisor will be used to pay for the expenses such as the business fixtures, rent deposits, signs, and other items or expenses needed to open up the business. Some franchises also come with a certain amount of products, goods, and/or services provided with the franchise fee. With this, the business will no longer have to loan money from a particular entity to be able to grow since franchisees will provide the capital need to set up the franchise. Franchising allows businesses to expand at a faster rate. Since a business will not have to deal with monetary as well as employee issues in franchising, the business or brand will be able to expand to a wider area easily, compared to a company-operated establishment. With the advancement of technology and the Internet, it has become more convenient and easier for businesses to expand internationally since a business can easily communicate and provide training to franchisees. 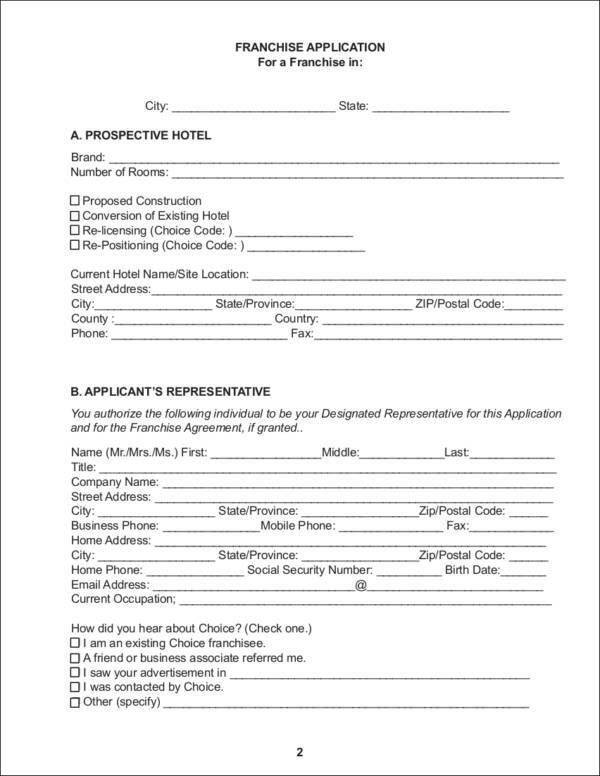 You can also see superior application forms. Another advantage of franchising is that it can assure a franchisee that a business will succeed. Aside from the advantages that franchisors get from franchising, franchisees can also benefit from franchising a business. Since franchising usually involves a well-known brand, a franchisee can ensure that the products and services offered by the brand will sell. This is because people already have an idea or are familiar with the brand, which will make it easier for the franchisee to sell their products, goods, and services to consumers. 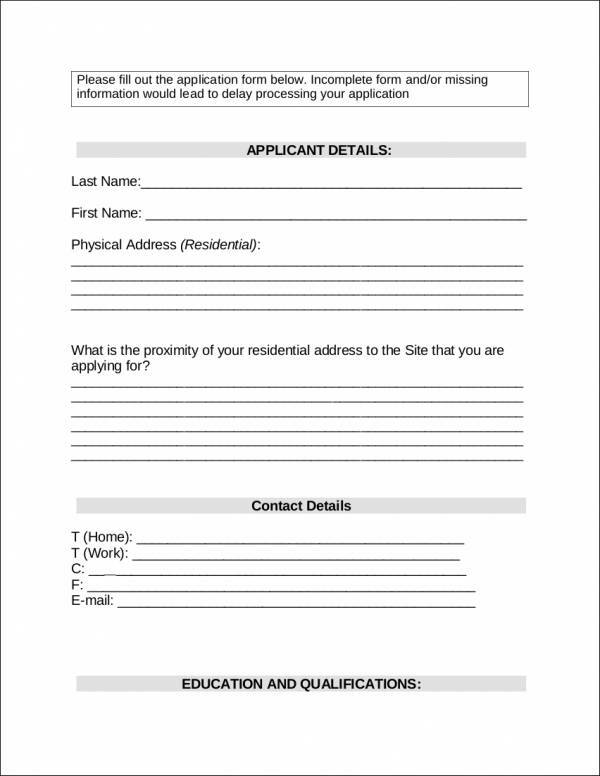 You can also see application forms in doc. One of the disadvantages of franchising is that both the franchisor and the franchisee share the profit that a particular franchised unit will get. Unlike a company-owned business wherein the business gets all the profit, in the case of franchising, both the franchisor and the franchisee share a percentage of the profit that the franchising unit will earn. Through franchising, the business owner will no longer have complete control over how a particular franchising unit or establishment is operated. The only thing that a business owner can do is to provide the training necessary to ensure that the franchisor follows the operating standards of the company or business. Franchising can lead to lawsuits. When a franchisee encounters a problem throughout the operations of the establishment or the franchise unit, particularly when a franchisee is not making enough money, a franchisor can be faced with a lawsuit. This can pose many problems for the business and the brand, specifically the loss of the business’s reputation, and litigation fees and costs can prove to be costly for the business. 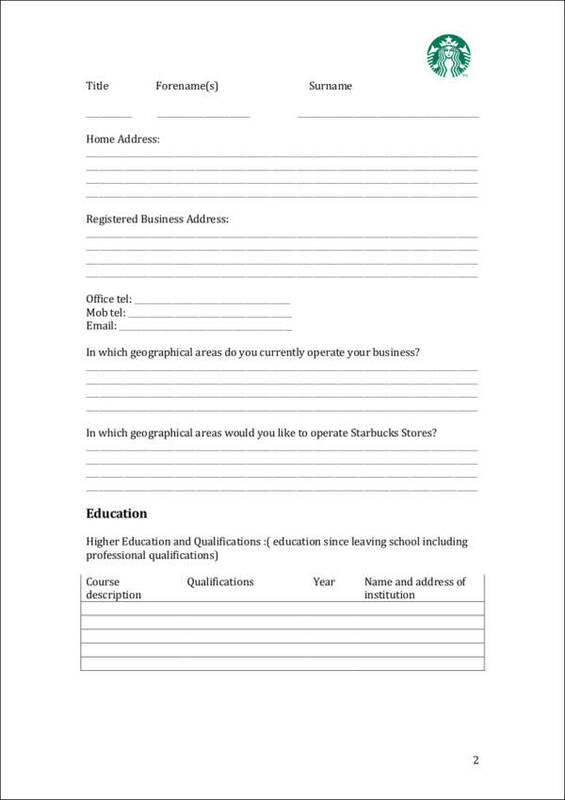 You can also see basic application forms. Always choose the right business or brand when franchising. Since franchising involves business that entails a lot of responsibilities and processes, when deciding for a business to franchise, it is important that you choose the right one that fits your expertise or the field. For example, if you are good at selling or if you have a passion for food products or goods, you can choose a food-related business franchise. This will make it easier for you to manage or handle the business.You can also see correctional services application forms. Always be open to improving your business skills. Although a franchisor will provide you with all the necessary materials, systems, and training that you will need when franchising a business, it is still essential that you know, as well as improve, your business skills to ensure the success of your business. Ensure that you follow the tips that we have listed above so you can have a successful business franchise. You can use the franchise application form templates in this article to help you format and outline a highly effective and organized franchise application form. More so, if you need to create other types of business forms such as an employee evaluation form, training evaluation form, or a request form, you can browse through our extensive selection of different business form templates and samples. You will also find more samples of business documents on our website should you need to create a specific type of document.